Srinagar, October 17 (Scoop News) - Underling the importance of restoration and conservation of heritage sites in the State, Chief Minister, Omar Abdullah Monday called for holistic approach by the concerned departments in this regard to preserve historic and cultural speciality of Jammu and Kashmir. Taking stock of the conservation programme of Samba Fort at a meeting here, the Chief Minister said that places of heritage have greater historic value and these speak in detail about different aspects of a civilization. Omar said Jammu and Kashmir possesses rich heritage and remarkable archaeological and architectural characteristics. “This special phenomenon of the State needs focused attention”, he said calling for preservation and protection of this glory of the State. The meeting was attended by Minister for Tourism and Cultural, Nawang Rigzin Jora, Minister of State for Tourism, Nasir Aslam Wani, Advisors to the Chief Minister, Mubarak Gul and Devender Singh Rana, Commissioner Secretary Tourism, Atal Dullo and various other senior officers. The Consultant of Department of Cultural and Tourism, K. A. Qadri in a Power Point presentation explained various works being undertaken at Samba Fort for its restoration and conservation. He said a comprehensive plan of restoration of the Samba Fort has been conceived at an estimated cost of over Rs. 4.87 crores. He said over Rs. 75 lakhs have been spent on various works for the restoration of the fort. Qadri said that conservation work of 5 forts of Hari Parbhat, Bahu, Reasi, Hira Nagar, Samba is being executed by the Department of Culture and Tourism while Archaeological Survey of India is working on the restoration of Ram Nagar Fort. Samba Fort is situated at a Commanding location and has greater historical significance. 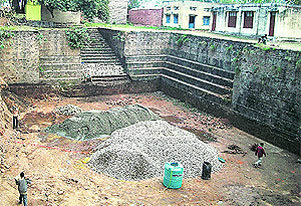 Sources place its date of its first construction around 13th-14th century AD. Samba Town was named after the deity Sumb and Raja Maldev believed to be representative of Sumb deity. In 1808-12 Maharaja Ranjit Singh conquering Jasrota brought Samba under his rule and gave its rule to Raja Suchit Singh brother of Maharaja Gulab Singh. The Samba Fort was rebuilt by Raja Suchit Singh in 1830 on the remains of earlier fort built by Naga Raja Gour Sen. The Government took its restoration and conservation programme in hand in March 2010 and so far Rs. 55 lakhs have been released for the purpose under the State Plan. The works so far undertaken include partial restoration of outer fort wall, restoration of water tank, clearance of malba and wild vegetation inside and outside the fort. The fort has been declared ancient monument under the Ancient Monuments Preservation Act 1920.